Betty Robin cuts the ribbon with her husband Si Robin for the grand opening of Robin Hall July 27, 2016. This weekend, UND will honor Betty and Si with an honorary degree for their work in supporting academics and facilities at the University. Photo by Jackie Lorentz/UND Today. The name “Robin” hangs from the heights of one of the University of North Dakota’s newest, tallest and most cutting-edge campus buildings. This weekend a grand gesture will be returned, when the honorary title of “Doctor of Letters” will hang from the personal walls of the building’s namesakes. Seymour “Si” Robin and Mary “Betty” E. Bazar Robin will be presented with honorary doctorate degrees at UND’s Spring Commencement Ceremony, to be held the afternoon of May 12. The Robins, who own and oversee the California-based aerospace antenna manufacturing company Sensor Systems, Inc., were the pivotal benefactors behind the design and construction of Robin Hall. 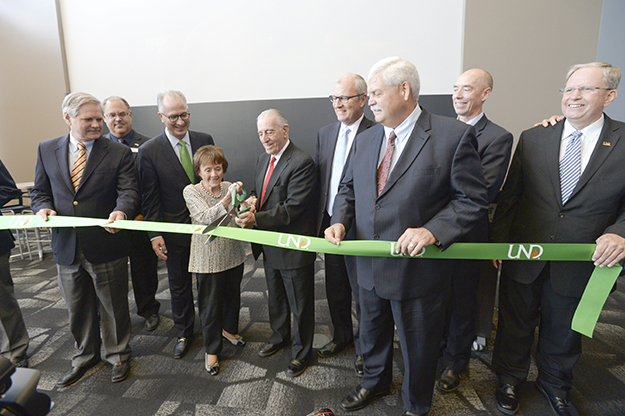 Si and Betty were there, nearly two years ago, to help cut the ribbon on the soaring $22 million building that now serves as home base to UND Aerospace’s pioneering work in unmanned and autonomous systems. “The contributions by Si and Betty added another first to UND’s long string of firsts in unmanned education and research – the first academic building devoted to unmanned,” said UND President Mark Kennedy, adding that the Robins’ strong support is made more amazing by the fact that they have no ties to the University, or even the state. The gift to UND Aerospace was spurred after a visit to campus in 2005, during which they felt a connection to the people, facilities and mission of the John D. Odegard School of Aerospace Sciences. 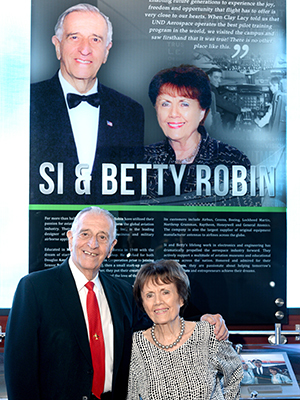 Si and Betty Robin stand in front of their portrait at the Legacy Wall on July 26, 2016, before the grand opening of Robin Hall, which the couple helped fund. Photo by Jackie Lorentz/UND Today. 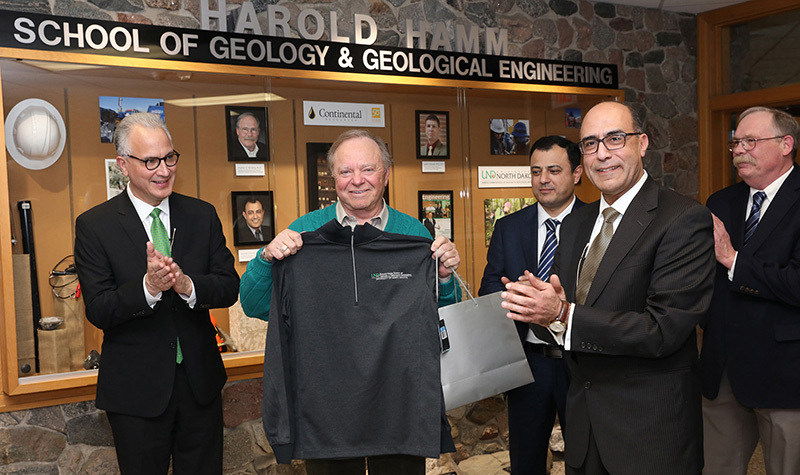 The business duo began giving financially to the University, which ultimately led to the development of a new building to focus on unmanned aircraft systems education and research. With a $1.5 million match from the State and support from other generous donors – including the UND Aerospace Foundation and the late UND benefactor James C. Ray – the Robins joined UND in breaking ground for the project in 2014. UND Aerospace Dean Paul Lindseth noted that Robin Hall now offers students not only SCALE-UP active learning classroom space, but also plenty of UAS labs, comfortable study space, and many small group briefing rooms for individual or group project work. On Saturday, the Robins will join an ever-growing list of hundreds of UND alumni and supporters who have been given honorary degrees, including President John F. Kennedy (recognized just weeks before his assassination) and UND alum and record-breaking Chicago Bulls coach Phil Jackson. Fred Wittmann, UND director of Ceremonies & University Events, says there is an annual nomination and selection process for honorary degrees. Not all commencement ceremonies include the honor, and not all honorees are alumni. 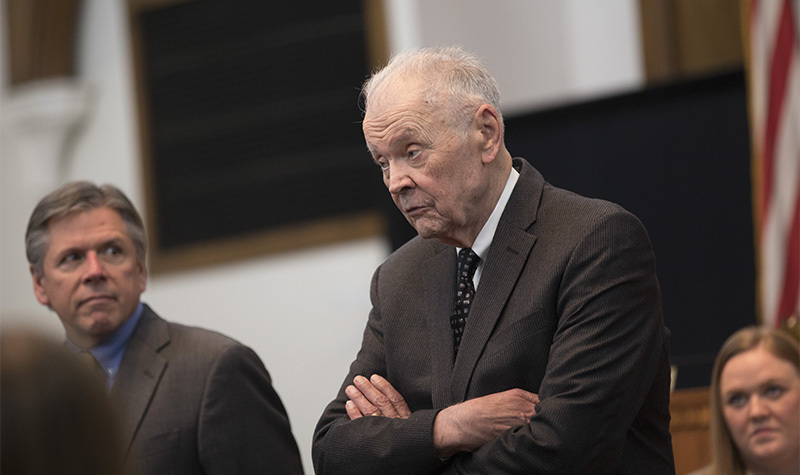 “In all cases, everyone who has received one, with only a few exceptions, has had some kind of direct and impactful connection to the University of North Dakota,” Wittmann explained. “It’s an impressive list, and one that I’m glad is always printed in the commencement program for people to see,” he smiled. Whether it’s inked in a graduation day handout or forged upon a towering building, the Robin name will be one forever in the minds of UND’s next airborne trailblazers. 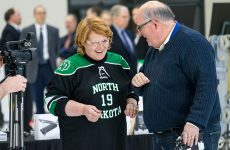 “Through their support, the Robins have granted invaluable opportunities to UND students for years to come,” President Kennedy said. UND provides a live video stream of commencement on our webpage to allow family and friends to participate in commencement, even if they cannot attend in person. We recommend that you set your device or computer to full screen format. If your screen is grey, please refresh it. The feed is iOS and Android compatible. “Celebrate Achievement,” features live interviews with students, a concert by the UND Wind Ensemble and videos about the University of North Dakota. The video streams will start shortly before each program. Video of the UND campus will appear on the stream until each program begins. The programs will also be streamed on UND’s Facebook page using Facebook Live and on YouTube. If you have trouble seeing the video, please contact tech support at http://techsupport.und.edu and chat with a representative or call 701-777-2222 (press 0 or remain on the line).